Who in your family has a story that needs to be collected before it’s too late? How did they serve our nation? Where were they sent in the service? What branch of the military were they in? 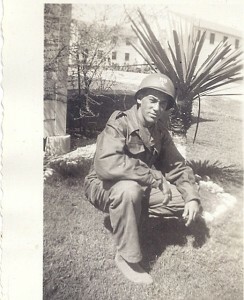 My father; the late Herman F. Marshall, a member of the U.S. Army, during WWII. He was stationed in Alaska to build the Al-Can Highway. I believe this photo may have been taken in Texas on his way home. His favorite memory of that trip was bumping a General from a flight, injured personnel, going home, had priority status. His ear drums had burst on a short flight in Alaska, he suffered temporary hearing loss and was discharged. He was sent home, the year was 1946. For all those who served in the military there are unique stories, some bound to become family classics. Here are 5 tips for collecting the family stories. 3.) Who was their best friend during their service time? 4.) What memory is the strongest from the time of service? 5.) What was the funniest thing that happened during your service years? Follow the strongest memory question with the funny question to lighten the atmosphere. Some memories of service are very painful to recall. Our understanding, appreciation and respect to these difficult memories may allow a family member to finally share a tough event they endured. Respect any Veteran’s wish to not continue a story, leave the door open, suggest at some time they write it down so that someday you will understand. Show gratitude for any story pieces you collect. Fill in the descriptions by searching for images from the event and time. Google Images and Pinterest are great places to start. Good Luck collecting a family story this holiday weekend. THANK-YOU TO ALL WHO SERVED!